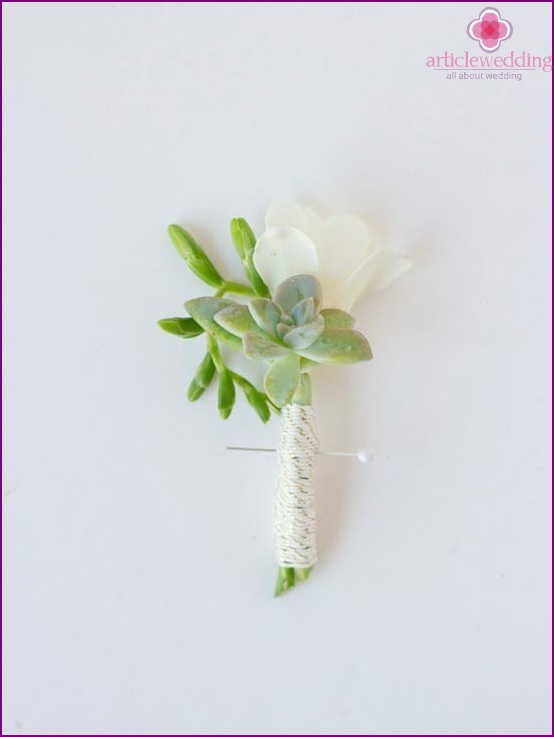 Recently, a very fashionable to use all sorts of unusual accessories for the wedding, to make an impression on guests and remember this day as the most magical. 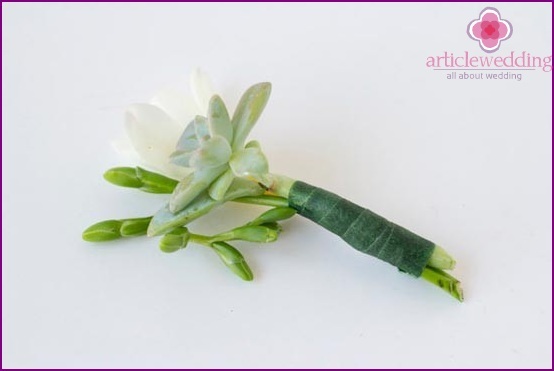 Everyone is used to the traditional corsage bride ofroses, but it is a long lost relevance. In order to do original and unique bouquet, florists use unusual flowers and plants. 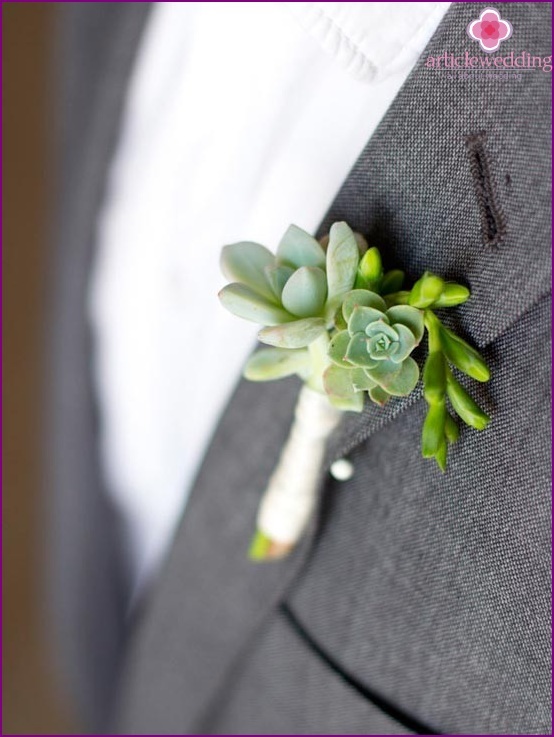 To create an unusual bouquet use succulents such as rock rose. 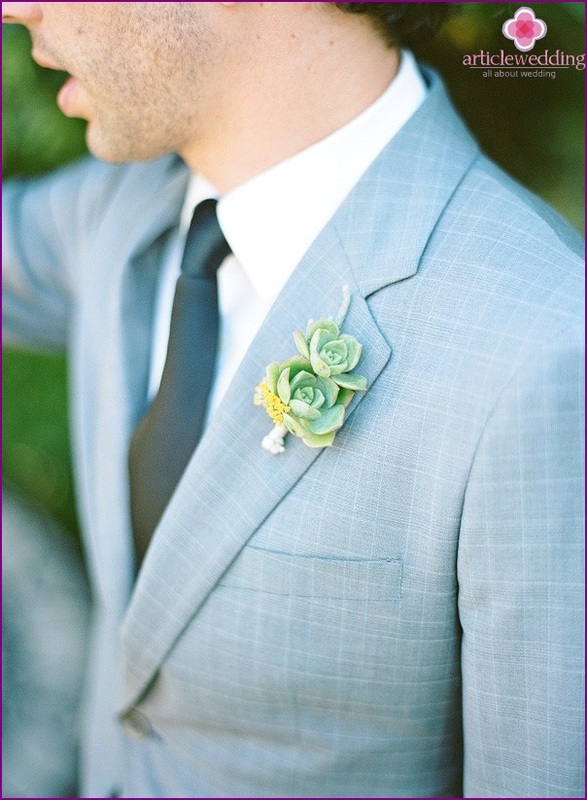 These green plants enliven the bride's bouquet and boutonniere for creating. Why do not you take this opportunity toto please his beloved fiance? 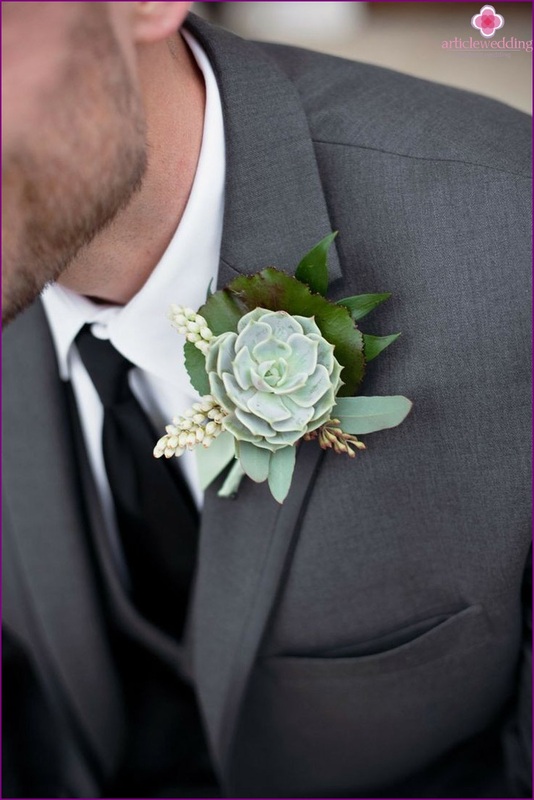 Wedding website www.articlewedding.com share the secret of how to make a beautiful boutonniere for the groom, using similar plants that in your trendy bouquet. This will allow you to combine your wedding images. The bride will be pleasantly surprised to have such a gift. 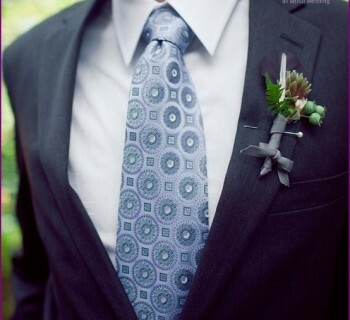 Moreover, such a boutonniere will be kept by theyou have some time and do not wither so quickly. It made it very easy and does not require any time-consuming. 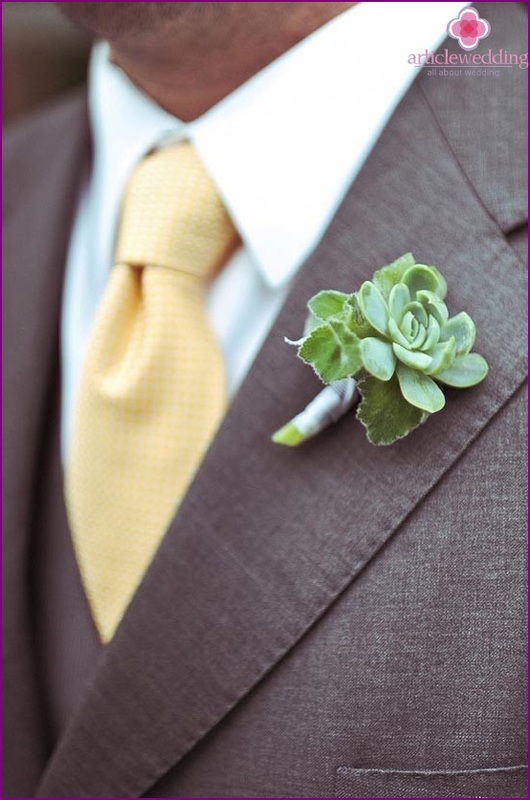 The main thing is to find the right plants that will be able to create an interesting composition in your buttonhole. 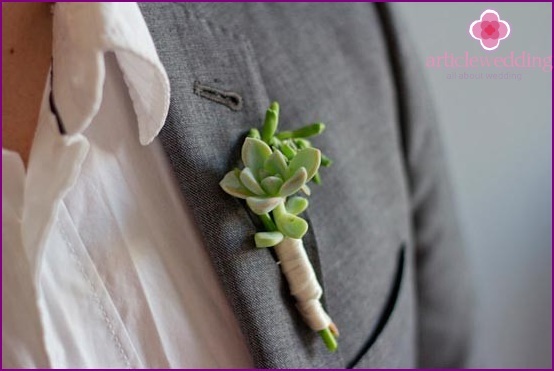 If you can not be lazy, you can make a boutonniere and a friend of the groom, who will appreciate your warm attitude towards his comrades. 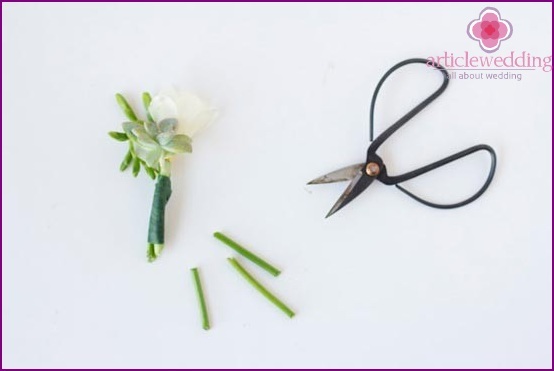 It's time to start master-class manufacturing cute bridal accessories with your hands! 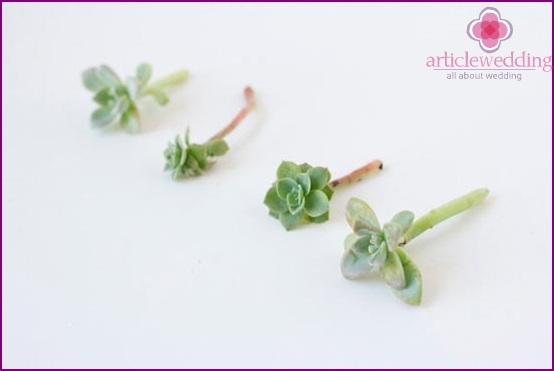 Succulents can be bought in a store or orderInternet. These plants are well adapted in the earth and feel good in the water. 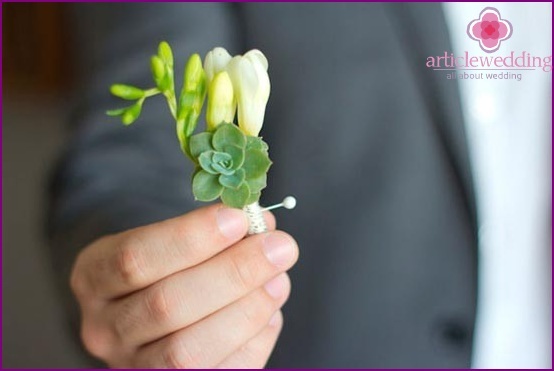 If you want to diversify boutonniere, add beautiful flowers, such as freesia, which blends perfectly with the green stone rose. To begin lay out plants and flowers on paperor cloth and clean them from the unnecessary branches to the legs were smooth. 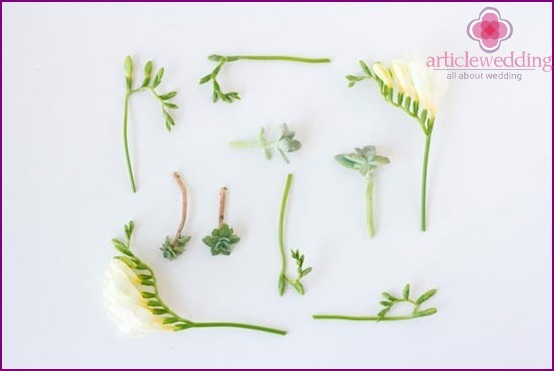 Put several plants together and tie their ribbon floral green. Trim the excess stems. The length of the stalks should not be too large. It is enough to leave a 8-10 centimeters. 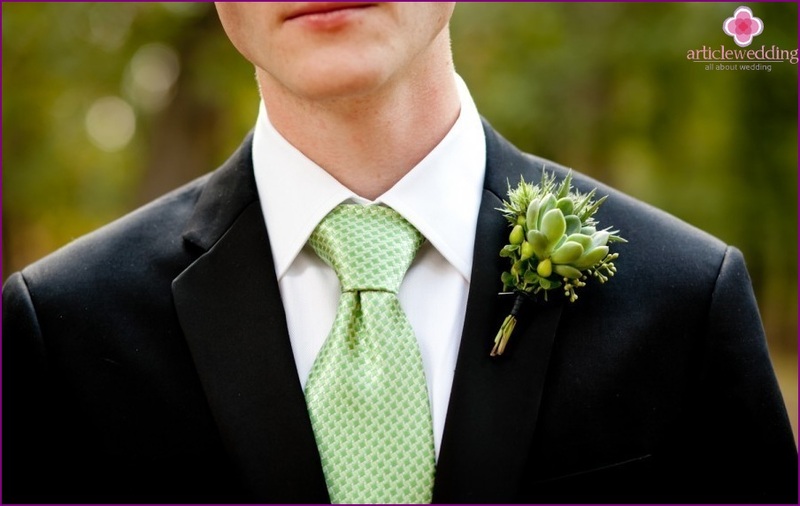 Arm yourself with a rope and start gentlywrap your legs boutonnieres, in order to hide the tape. The rope looks very original and stylish, especially in white, gray and brown tones. 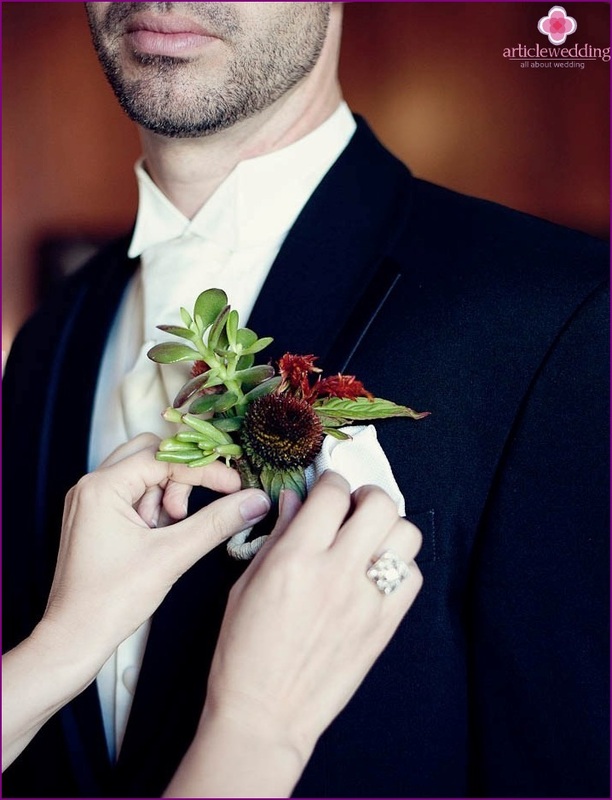 Bright colors such as pink, purple or red, are not very suitable for fashionable boutonnieres. 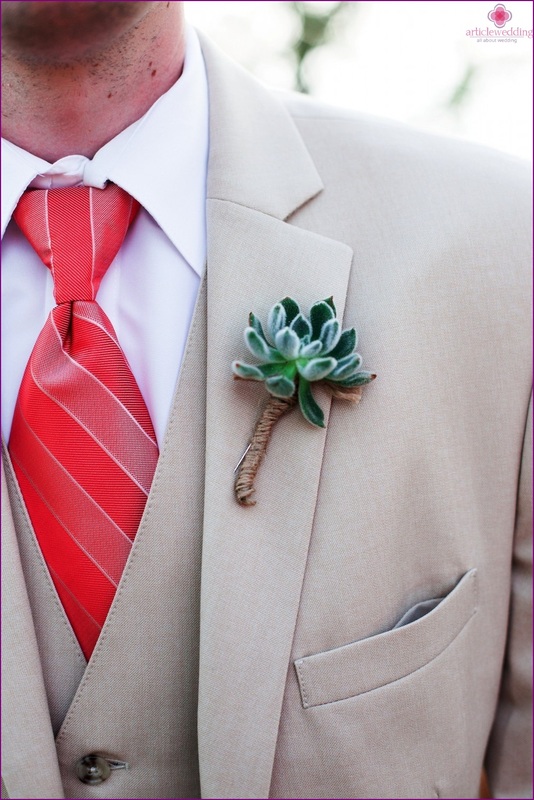 It remains only to fix the boutonniere on his jacketyour lover. Such a nice item is sure to make him smile, and you will make a bright pair. 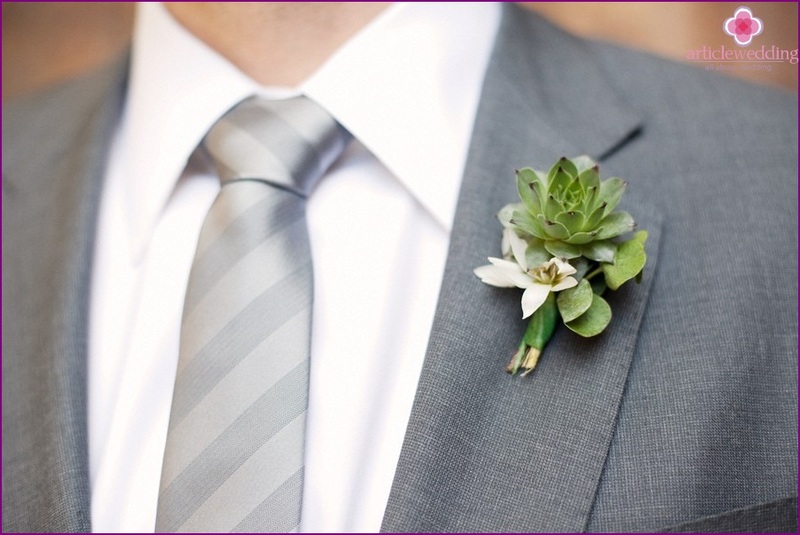 Make a few of these buttonholes and give the groom's friends. The advantage of rock rose is that itthe plant can survive without water for a long time and does not wither. 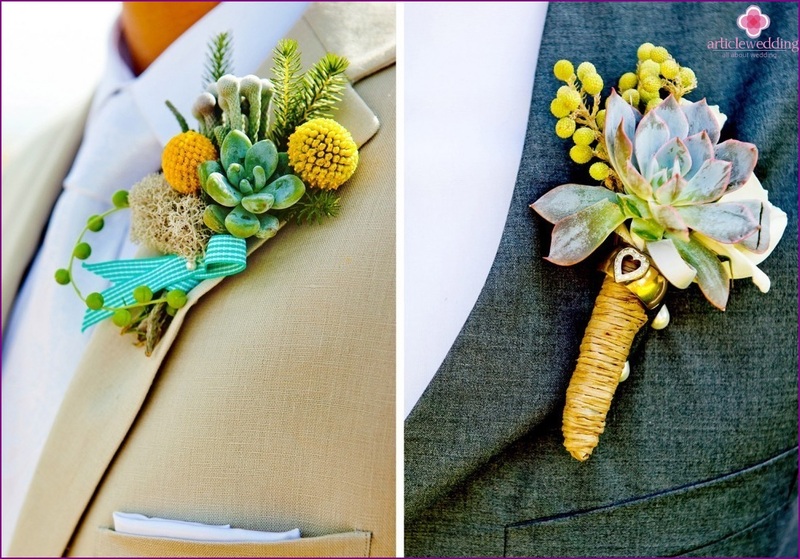 Bouquets and boutonnieres to the use of such plants will last you longer. 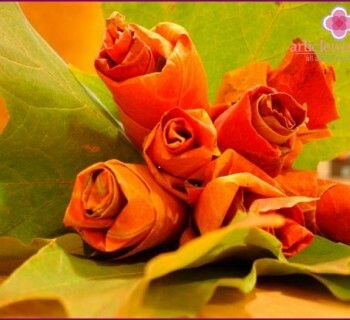 You can make many such bouquets and give away guests as sweet dishes. You can add to the stone rose various flowers. Look beautiful yellow and white flowers. 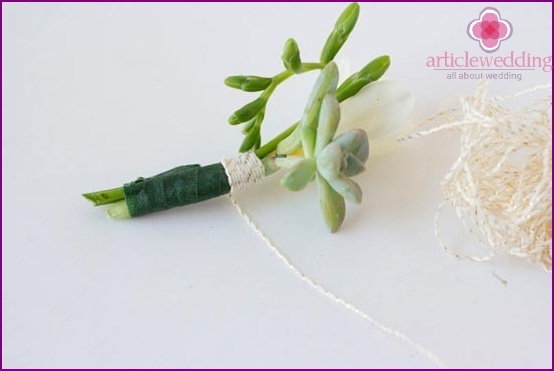 Instead, use the rope satin ribbon, more importantly, to hide the stems and secure them tightly. a combination of rock and bush roses white rose also looks nice. 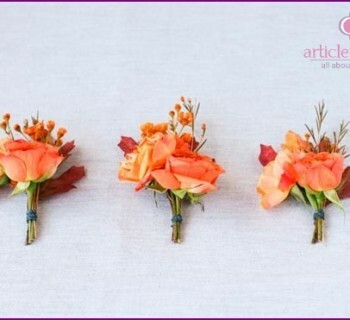 You can also distribute such bouquets every guest on a plate as a decorative ornament. 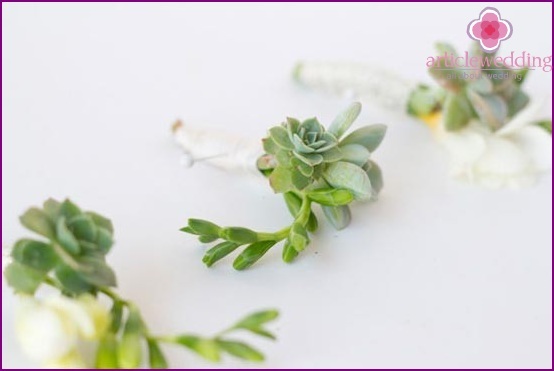 Also, succulents can be used to create a bracelet on her hand the bride and her bridesmaids. 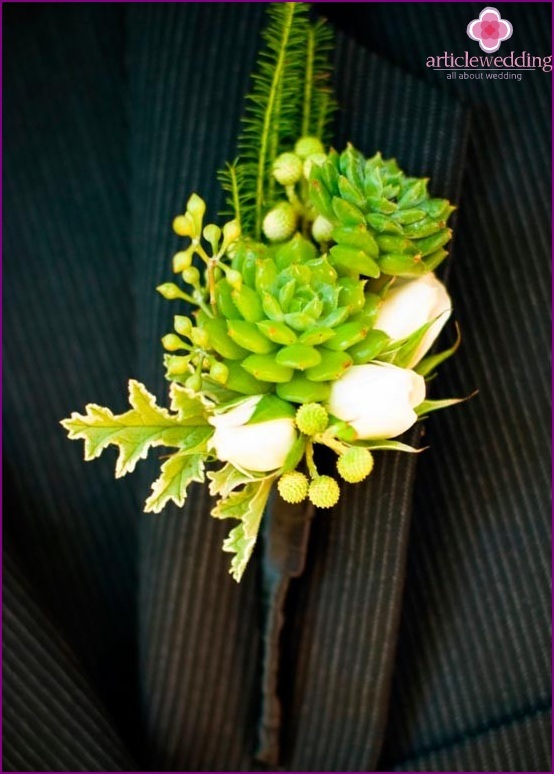 These original plants will help you to add flavor to your wedding celebration. Www.articlewedding.com On site there are many more exciting master classes, which will help you to surprise your groom and impress guests. Office romance, myth or reality ? !